Savoury Kitchen by DigiDynamic. Products and installation by Command. 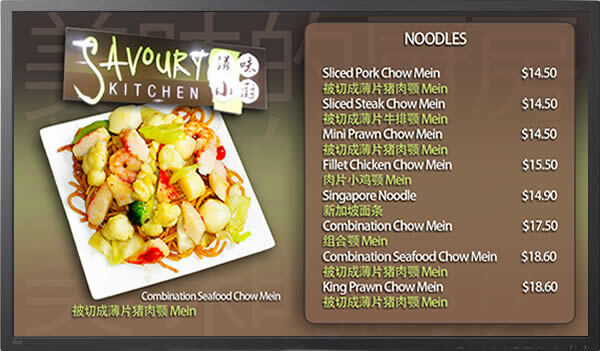 Restaurants and Take-away shops are the ideal business for digital signage. Command's digital menu boards can include a single screen or a bank of screens to display multiple menus - all managed from a single location. A Digital Menu Board is very flexible in allowing the user to display TV, news, weather and promotional items along with their menus. Your displays can change from full screen menus to zoned areas with a combination of menus and other media..
Digital Menu Boards can be configured to automatically change menus. As an example, a Breakfast Menu, a Lunch Menu, Afternoon Tea or even a Dinner Menu can be scheduled to change at your specifie time of day. Background music is controlled through the same system. Where your menu board is critical to your business, Command has systems with automatic redundancy to make sure your menu is always on display. • Affordable, entry level Digital Signage to fully managed corporate solutions. • Remote Management, Multiple Display Zones, News Ticker. Command is the South Pacific Distributor of Navori Digital Signage Software. Navori is a leading digital signage software that is setting a new standard for Content Management, Delivery and Playback. Robust and reliable, suitable for the single user or Enterprise Installation. Navori QL Digital Signage Software Overview - Select here.